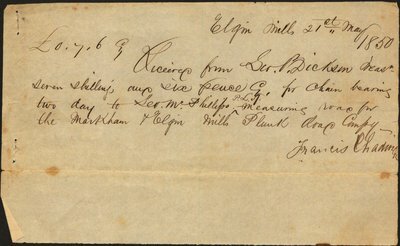 Receipt for payment issued for measuring of Plank road. In the year 1850, a company was formed called “The Markham and Elgin Mills Plank Road Company”, with Mathew Teefy as Secretary-Treasurer, to plank the side road from Elgin Mills across to the 4th concession, then south through Victoria Square to Cashel. Toll gates were established where travelers paid for the privilege of using this road. In 1950, some of the planks were dug up near Elgin Mills, and used as kindling wood.